I first became a virtual assistant (or VA as we like to be known) in 2008, after having been employed as a PA/Secretary for over thirty years. I had known, for some time, that VA’s existed in America, Canada and Australia, but that it was a relatively new, but up and coming industry in the UK. I have the use of office space, which I sometimes retreat to, but one of the things that appealed to me about being a VA was that I could do it anywhere, and this is where our 60 foot narrowboat, Mawddach, comes into the equation. Armed with my trusty dongle from Orange, I can complete assignments and email them off to my clients wherever I am on the canal. Going away on our boat doesn’t mean that my work has to stop. As long as I have the technology loaded up on my laptop, I know that my location won’t hamper me in the least. Mawddach is based on the Shropshire Union Canal and I can take a trip to Gnosall or Market Drayton, moor up the boat, and still get on with my work. Every day is different as a VA. During the week I am transcribing interviews, compiling databases, carrying out admin duties for the twenty five or so clients which I have, or making Skype calls to colleagues and potential new clients. I start the day off by looking at my emails, checking my phone messages and then prioritising the work. Some week days and weekends are spent on the narrowboat, but I know that I can do this safe in the knowledge that I can still carry out all the work that is required of me, and get the assignments completed on time. 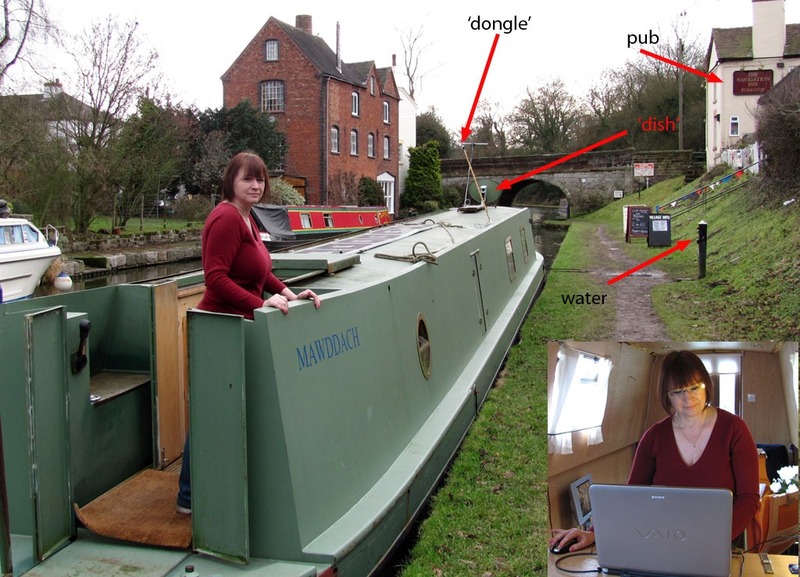 I sometimes think that the very first bloggers were probably those who lived on their canal boats and who needed to contact their family and friends, who were keen to be advised of where they were and what they were doing. Canal boat owners have always been abreast with new technology, with their satellite televisions, their iPod players and their solar panels to help them top up the batteries on the boat’s electricity systems. I am in good hands then on the Cut! Virtual assistants – the new breed of any time, any place, anywhere admin assistance! If you see me on the canal, give me a wave! Hi, I really enjoyed your article,I have just taken the plunge into starting my VA business. I have yet to gain my first client, but I am busy networking.